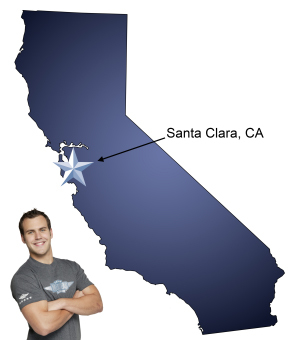 For a trouble-free move to Santa Clara, Meathead Movers is the company for you! Our professionally trained student-athlete movers are ready to get you into your new Santa Clara home. If you are moving to or from anywhere in Santa Clara, we are the only moving company for you! Our professionally trained student-athlete movers and our move concierge are eagerly waiting to create the perfect move experience to satisfy your every moving need. From great work opportunities to higher education to family fun, Santa Clara offers something for everyone. With major multi-national corporations like McAfee, Sun Microsystems and Intel, there are plenty of opportunities to find great jobs! Santa Clara also has a great public education system and is home to Santa Clara University. Once you move to Santa Clara, you can enjoy exploring the Berryessa Adobe, Mission Santa Clara de Asis, and the Triton Museum of Art. For a little more thrill, you can visit California’s Great America, a theme park that has fun for the whole family! If you are considering a move to Santa Clara, you should choose movers with a proven track record. At Meathead Movers, we have been moving residents all through California since 1997, and have earned the reputation as the go-to moving service when you want your move done precisely and efficiently. Our all-American, clean cut student athletes are meticulously equipped, painstakingly trained, and 100% dedicated to making sure you receive the best moving experience possible. As you may have heard, our movers jog when not carrying anything, which saves you valuable time, that way you can focus on more important things. Over the years, we’ve done hundreds of moves in the Silicon Valley. We’ve differentiated ourselves in Santa Clara and other tech-centric cities like Palo Alto and Cupertino by our completely fresh and sophisticated approach to handling your move. From our sleek black moving trucks that use bio-diesel to our paperless way of doing business to sharing 100% transparent customer reviews, our clients can easily see how we go above and beyond. Whether you are moving to, from, or within Santa Clara, we are here to support you along the way. Our services range from local, long-distance, commercial, and even on-site moving. In preparation for your move, please make use of our handy Moving Checklist. Also, check out our amazing packing professionals, Princess Packers. These are just a couple tools that we have created to help you with your move. We know moving is stressful, but it’s our job to ease your transition. When you entrust your move to Meathead, you can rest assured knowing that your move will be a success because our professionally trained student-athlete movers are the best movers the industry has to offer. In fact, you can see what your neighbors in Santa Clara have to say about us! Contact us today for a free no-obligation estimate and experience the Meathead Difference. With our 100% satisfaction guarantee, the only thing you have to lose is the stress that comes from moving! Moving to Santa Clara? Here are some helpful resources. View more Santa Clara resources. Sales team was very courteous, move team was attentive and generally fun to be around. Professional, courteous and attentive workers. I appreciated how they carefully wrapped all of my very heavy furniture in plastic and blankets to keep everything safe from damage. They were courteous and professional.